You have to admire the skill of the inventors and lock makers of the past. They and their workshops may have all but gone, but the surviving lock with its aesthetic look and mechanical beauty can tell a rich story which I would like to preserve and promote. Within the U.K and beyond thousands of old antique locks remain, many still fully functioning many sadly no longer used. 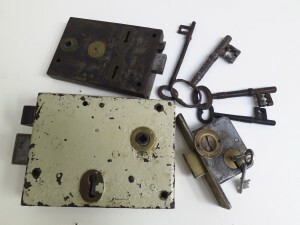 Chambers Lockwork can offer a refurbishing service to repair, refit or if necessary replace your old antique locks with an appropriate mechanism. Old keys can be painstakingly replicated and hand – cut or replacements can be made using replica models, thus maintaining the look of the door in keeping with the heritage of the property, be it a church, old industrial building or a domestic dwelling. Chambers Lockwork would love the challenge of meeting your needs.